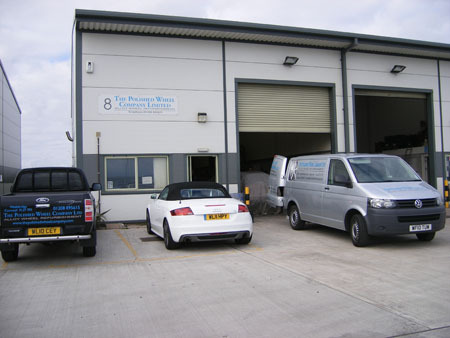 The state of the art machinery installed at our premises in Wadebridge, Cornwall, enables us to provide an as original factory finish at a fraction of the cost of buying new alloy wheels and an invaluable service to the classic car owner where it is not always possible to source replacement wheels. Wheels are chemically stripped in a custom built hot chemical stripping machine overnight, prepared, primed and painted both sides using the latest technology and baked at a high temperature. finally wheels are laquered to help protect wheels from the elements. Our custom built lathe enables us to offer our customers the option of machine polished face and rim (diamond cut), as required and to original specification. Please note that polished alloy surfaces do need to be waxed regularly with a good quality, clear body wax to maintain their condition. The Polished Wheel Company, set up in 2008 pride ourselves on offering excellent quality Alloy wheel refurbishment at a reasonable price and a great service. We refurbish wheels on behalf of many prestigious car dealerships including Audi, Ocean BMW, VW Carrs, Tregoning Ford, Westerly BMW and Mercedes Benz. We also offer a service for those customers wishing to book their car into our premises and we will refurbish the complete set of wheels for you, refit tyres and balance wheels ready for you ready to collect your car at the end of the following day. We will need extra time if polished. It is essential to book in advance for this service. The Polished Wheel Company are pleased to offer the above services to both trade and retail customers. Collection and delivery service of loose wheels by our own vans available to trade customers in Cornwall, Plymouth and Exeter areas. For customers outside of Cornwall & Devon we will be pleased to arrange collection and delivery of your wheels via a nationwide Courier company.